Wednesday, August 6, 2014, was a typical August day in Oklahoma City, with temperatures in the mid‑90s, the heat index peaking at 99 degrees and overcast skies turning clear in the early evening – the dog days of summer were clearly upon us. With school starting in two weeks, my wife, Sue, our youngest son, Devin, and I enjoyed a family day together, going out for a movie, dinner and ice cream. Little did we know that in a few short days our world would be shattered by sepsis – a little-known illness that affects over 1.6 million Americans every year. Late that evening, Sue started experiencing an intermittent fever and chills, pain in her neck and a sore throat that continued throughout Thursday, so she called in sick from her job as a circulation clerk at the Choctaw Public Library. Sue was always the healthiest one in our family, so, since her symptoms hadn’t subsided, we went to the local emergency room Friday morning at approximately 1:30am. Sue was seen within 5-10 minutes of arriving at the ER. She presented with a high heart rate, low blood pressure, sore throat and pain/soreness all over, particularly in her neck, and rated her pain as a 9 out of 10. Now, when a guy rates his pain as a 9 out of 10, he probably has a papercut, but when a woman who has given birth rates her pain a 9 out of 10, then she is obviously in severe pain. After testing negative for strep throat, the ER doctor diagnosed Sue with a viral infection, prescribed cough syrup with codeine, and told us she would feel worse before she felt better. We didn’t know it at the time, but Sue’s vital signs were critical red flags that she was very ill, but the doctor failed to recognize and act on them. When I awoke Saturday morning and walked into the living room, I saw Sue sitting on the couch and knew that something was terribly wrong. She had nausea and diarrhea, was lethargic, and couldn’t walk without extensive assistance. We returned to the ER, arriving at approximately 9:30am and again, Sue was seen within 5-10 minutes of checking in. Her heart rate was 132, blood pressure was 68/42, and she had excruciating pain in her arms. The ER doctor believed that Sue had urosepsis from a urinary tract infection and needed to be admitted to the ICU for “probably three days.” He was nearly right, but for all the wrong reasons. By the time I arrived at the intensive care unit with our oldest son, Tyler, Sue was feeling much better as the painkillers overwhelmed her body and gave her much-needed relief from the excruciating pain that she was experiencing. Unfortunately, it also gave us a false sense of security and masked the extent of her illness. 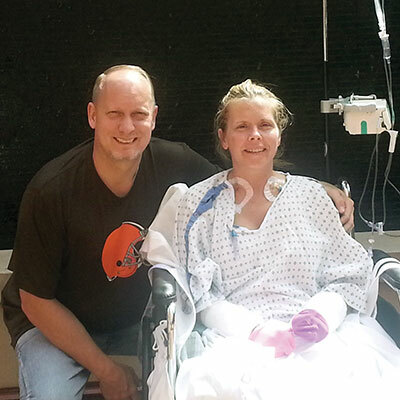 Sue was in an all-out fight for her life, but the ICU doctors simply told me that she had sepsis! At Sue’s urging, we left shortly after 6pm with strict orders to get something to eat and come back Sunday with her Nook so she could read. When we arrived home, I started researching sepsis and septic shock and was horrified by what I was reading – Sue was in septic shock, and the mortality rate was 40-70 percent! I returned to the ICU later that evening and stayed until Sue was sleeping peacefully at 2:30am Sunday morning. After a short night, I showered and headed back to the ICU, arriving at approximately 9am. The ICU nurse saw me and pulled me aside to tell me that Sue had crashed earlier that morning and was now on a ventilator – apparently, they had called me but I missed the phone call. Words can’t adequately describe what I saw as I walked into her ICU room. Sue was hooked up to a ventilator and had more than a dozen bags of antibiotics, fluids, painkillers and vasopressors being pumped into her body in an attempt to fight an unknown infection and her body’s inflammatory response to the infection. I spent some time with Sue until she was resting; then, I called family to tell them that Sue was in critical condition and that they needed to get to Oklahoma immediately. Sue’s condition continued to deteriorate throughout Sunday and Monday and her hands and feet became mottled with purplish and red-blue blotches, which is a sign that death is very near. Nothing on Monday went our way – as soon as Sue’s fever started to subside, her blood pressure would plummet even more; if her blood pressure stabilized, then her fever would spike to 104. By Tuesday morning, Sue’s infection was ravaging her body. Her kidneys had failed, her lungs had failed, her liver had failed and she had had a minor heart attack. Sue’s 5am blood work showed her platelet count had dropped to 11,000, meaning the slightest cut would most likely result in her bleeding to death. The attending physician made his usual rounds at 1:30pm and told me what no one ever wants to hear – he advised me to prepare myself and our family to say our final goodbyes, as he gave Sue less than a 5 percent chance of survival. The second ER doctor had said he expected Sue to be in ICU for three days. This was the third day, but we had never remotely expected to be saying final goodbyes. Tuesday evening at approximately 7pm, with family and close friends by her side, I explained to Sue, as I had several times before, that she had an infection, was in septic shock and we were doing everything we could, but her condition was dire. Amazingly, Sue never lost consciousness and consistently answered my questions by nodding or shaking her head yes or no. As I finished explaining her condition, I told Sue to let me know if she no longer wanted to fight anymore. During this entire conversation, Sue had kept her eyes closed, but as soon as I finished speaking, her eyes shot open and she gave me the dirtiest look I’ve ever seen. Alright, then – Sue was still fighting and so were we! Sue defied all odds and made it through the night. Wednesday morning’s 5am blood work brought the slimmest glimmer of hope – Sue’s platelet count was 56,000 after an intravenous immunoglobulins (protein produced by plasma cells and lymphocytes) treatment Tuesday night. Truth be told, the rise in Sue’s platelet count, while a positive sign, truly meant very little in her fight against sepsis. But when things are dire, you need something, anything, to renew one’s hope and swing momentum in your favor. Over the next 10 days, Sue’s condition improved incrementally and it became apparent that she had beaten the septic shock. However, the effect of the sepsis and the vasopressors (agents that stimulate contraction of the muscular tissue of the capillaries and arteries) used to keep her alive resulted in bilateral below-knee and bilateral below-elbow amputations. Sue was a quadruple amputee. Nothing in life can prepare you for such a sudden, dramatic, life-changing event like our family went through, but early in the recovery process, Sue came across a quote: “You can get better, or you can get bitter.” While we’ve had our ups and downs, including a lot of very bad days in the beginning, she made the choice to get better. Through courage, sheer will and determination, Sue has regained her independence and relearned how to do everyday things like putting on her makeup, doing her hair, putting in her contacts, and cooking dinner for her family! We’ve skydived, rode roller coasters, walked in multiple 5Ks to support sepsis and limb loss awareness, swum with manatees, and mentored other amputees and their families. Simply put, Sue is my wife, best friend, confidant, inspiration and superhero! Sepsis is the body’s overwhelming and often life-threatening response to an infection that can result in tissue damage, organ failure and death. Sepsis was classified as a medical emergency by the Centers for Disease Control and Prevention on August 23, 2016. It kills more than 258,000 Americans every year – more than breast cancer, prostate cancer and AIDs combined! In addition, sepsis accounts for 38 amputations a day. Despite these alarming statistics, only 58 percent of American adults have heard of sepsis, and only a fraction of those are familiar with the symptoms of sepsis. Every hour that sepsis goes undiagnosed or untreated, a person’s mortality rate increases an astonishing 7.6 percent. Successful treatment of someone who is septic is measured in seconds, minutes and hours, not months and years like cancer and AIDS. Sepsis accounts for nearly 50 percent of all hospital deaths and $24 billion annually in hospital costs. Although the most common causes of sepsis are pneumonia, urinary tract infections, the gut/intestines and soft tissue infections, those with amputations are also at risk – an ill-fitting socket can result in skin breakdown and quickly lead to an infection if not properly cared for. Our family’s battle with sepsis started in early August 2014. Unlike most diseases, illnesses and conditions where there is a cure, sepsis has none, and its effects will be a part of our lives every day for the rest of our lives. We want everyone to know the symptoms and stages of sepsis, in the hopes of keeping other families from going through what we experienced.